On February 12, 2015, Representatives from Harvard Law School’s Center for Health Law and Policy Innovation (CHLPI) presented to the members of the Presidential Advisory Council on HIV/AIDS (PACHA) during a two-day long meeting on progress and challenges to the council’s charter of advancing the prevention and cure of HIV and AIDS and ensuring that those infected with HIV or AIDS are provided with quality care. 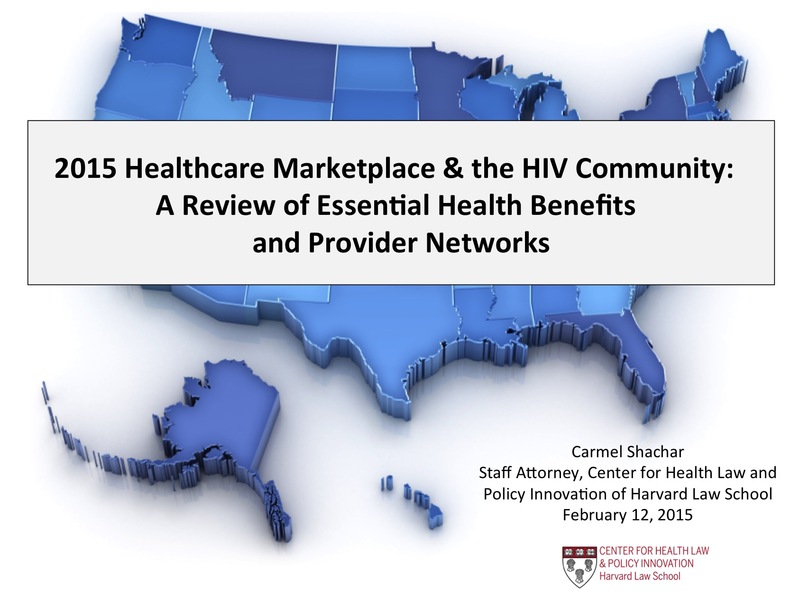 Carmel Shachar, Staff Attorney for CHLPI, presented “2015 Healthcare Marketplace & the HIV Community: A Review of Essential Health Benefits and Provider Networks” and highlighted findings from CHLPI’s Speak Up! project and other initiatives on discriminatory practices by insurance providers against individuals living with HIV/AIDS. Many plans on the health insurance marketplace throughout the nation are placing HIV medications on formulary tiers with very high levels of cost-sharing, requiring individuals to pay for a very significant portion of health care costs not covered by their insurance plan. Instances of adverse tiering and prohibitive cost-sharing are more prevalent in the South; CHLPI’s review of the qualified health plans (QHPs) offered in five southern states in 2014-2015 found that more than half of the plans required co-insurance of at least 30% for HIV medications. “These biased practices translate to an extreme and unsustainable financial burden inequitably imposed on those least able to bear it. Studies published in the New England Journal of Medicine have found that an individual living with HIV who is enrolled in a plan with adverse tiering will spend $3,000 more per year than an individual enrolled in a different plan,” Shachar explained to the meeting’s attendees. Based on CHLPI’s research and findings, Shachar presented recommendations to PACHA on how to address these alarming trends through law and policy changes. They include amending the Essential Health Benefits (EHB) rule to require coverage of specialty drugs widely accepted in treatment guidelines or best practices, and prohibiting excessive coinsurance for specialty drugs. CHLPI is also calling for all Marketplace plans to provide complete, accurate, and accessible formulary information in a standard format to increase transparency and understanding for plan participants. On Thursday, February 5, New Jersey took an important first step towards the goal of providing key diabetes services to its Medicaid beneficiaries. In a hearing session, the Assembly Health and Senior Services Committee of the New Jersey legislature approved the text Assembly Bill 3460. If passed, this bill will improve diabetes care for vulnerable populations in New Jersey by providing Medicaid coverage for diabetes self-management education (DSME), the Diabetes Prevention Program (DPP), medical nutrition therapy (MNT), and expenses for supplies and equipment for the management and treatment of diabetes. Several diabetes advocates, including Stephen Habbe (Advocacy Director, Northeast, American Diabetes Association (ADA)), Francine Grabowski (Program Manager, Cooper Diabetes Education Center; Lead Diabetes Educator, Camden Coalition of Healthcare Providers) and Michael Johnson (Director of Association Initiatives, The Gateway Family YMCA) testified in support of the bill. These advocates explained that, each year, diabetes takes a dramatic financial ($5.4 billion in medical costs and $2.4 billion in indirect costs) and personal toll on New Jersey. These advocates therefore urged the committee to support the inclusion of DSME, DPP, and MNT in the state’s Medicaid program as critical evidence-based diabetes interventions. Committee Chairman and bill sponsor, Assemblyman Herb Conoway Jr. also expressed strong support for the bill and its potential to reduce costs while extending the lives of individuals living with diabetes. After hearing this testimony, the committee approved the bill to be passed out of committee almost unanimously (11-1). The bill has therefore moved on to the next step in the legislative process—consideration by the Assembly Appropriations Committee—where it will hopefully meet with equal success. As highlighted in Stephen Habbe’s testimony, this legislation seeks to address some of the coverage gaps identified in the Center for Health Law and Policy Innovation’s New Jersey PATHS report. We are therefore very excited to see the bill pass this first legislative hurdle, and we will continue to provide updates on its progress through New Jersey’s State House. For more information about our work on diabetes policy, visit our new website: www.diabetespolicy.org. Fundamental Navajo law includes the concept of ho’zho’, loosely translated to “balance.” In a workshop hosted by the Food Law and Policy Clinic (FLPC) from February 9-11, Navajo Nation food advocates described how their current food system is out of balance, leading to environmental, health, and economic challenges among its residents. Over three days, the Navajo advocates and FLPC staff and students talked through strategies to change laws and policies on the federal, tribal, state and local level to improve the food system and gain back this sense of balance. These discussions will play a key role in FLPC’s work to develop a toolkit that identifies the main food policy and advocacy challenges that the Navajo Nation faces today, and strategies to overcome these challenges through policy change. 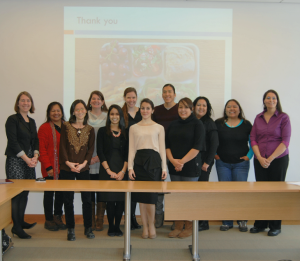 The FLPC has been working with the Navajo Division of Health for the past two years, exploring ways in which Navajo leaders can address health and food sovereignty challenges in the Navajo Nation through food policy change. In Navajo Nation, healthy food is often costly, difficult and time-consuming to find, while heavily processed, high-calorie and nutritionally poor foods are far more prevalent. The biggest Native American reservation in the United States, Navajo Nation includes large “food deserts,” defined by the U.S. Department of Agriculture as low-income communities that have “low levels of access to a grocery store or healthy, affordable food retail outlet.” Food insecurity is estimated to affect a staggering 76% of households in Navajo Nation. The lack of fresh, healthy food perpetuates health disparities, as over 40% of the total Navajo population (which stands at over 180,000 people) are overweight or obese. How can these often remote, rural and low-income communities improve their access to healthy food and beverage options? And what role does law and policy play in improving the food environment? During the workshop, FLPC staff and students discussed with Navajo food leaders the policies that affect the Navajo food supply at the tribal, local, state and federal level. The dialogue was helpful and constructive for both sides. FLPC members shared their knowledge of how to use law and policy to make positive impacts on health and food sovereignty, while Navajo advocates provided their unique insights as food advocates and as members of the community to which the toolkit is tailored. The discussions touched upon issues such as the interplay between Navajo, state and federal government, the infrastructure of the Navajo food system, healthy food access, federal and tribal food assistance programs, and school food in the Navajo Nation. While the snow in Boston presented some challenges to touring the city, workshop attendees and the FLPC team were able to visit the North End and Copley Square neighborhoods for dinner, and participated in a tour of Harvard’s Peabody Museum of Archaeology and Ethnology, which features an extensive collection of Native American artefacts and art. On Wednesday, February 11th, some Navajo advocates led a presentation open to the public, describing their efforts to improve regional food systems in Navajo Nation by building upon community resources. Lastly, representatives from the Harvard University Native American Program joined the workshop on the last day to describe resources around Harvard for the study of Native American issues as well as avenues for greater engagement between the Harvard and the Navajo Nation. The FLPC team plans to visit our partners in Navajo Nation later this spring to learn more about their food system and lead trainings on how to advocate for better food policies in Navajo Nation. To stay up to date on our work with Navajo Nation and FLPC’s other projects, follow us on Facebook and twitter. On January 12, 2015, I attended the 55th Presidential Advisory Council on HIV/AIDS (PACHA) in Washington, D.C. I attended the panel titled 2015 Healthcare Marketplace: A Review of Essential Health Benefits and Provider Networks. My supervisor at CHLPI, Carmel Shachar, presented on the panel, along with Doug Wirth, President and CEO of Amida Care, Melissa Harris, Acting Deputy Director of the Disabled and Elderly Health Programs Group at the Center for Medicare and Medicaid Services (CMS), and Brian Webb, Manager of Health Policy at the National Association for Insurance Commissioners. I attended the panel as part of my work as a student in the Health Law and Policy Clinic of the Center for Health Law and Policy Innovation (CHLPI). This semester at CHLPI, I am working on the Speak Up project. The Speak Up project encourages consumers living with HIV to report issues they are having with insurance as the Affordable Care Act (ACA) is implemented to advocates. Some of the data used in Carmel’s presentation was drawn from Speak Up activities. The panel was extremely interesting because it demonstrated the difference in effectiveness of care in different parts of the country. Mr. Wirth started the panel with an uplifting presentation about Amida Care, a Medicaid Special Needs Plan for people with HIV in New York City. This Medicaid Managed Care Plan takes a holistic approach to providing HIV care, offering not only standard medical care but also whole person care services such as African dance classes and yoga classes. Amida Care includes a Member Advisory Council, which allows elected members to meet with the CEO, COO, Medical and Pharmacy Directors to make recommendations. Amida Care’s member participation struck me as refreshingly different than a normal insurance plan. Despite the incredible program at Amida Care, the panel highlighted for me how much more work needs to be done. Carmel’s presentation laid out the issues that CHLPI is seeing with marketplace plans using actuarial value to pass on costs disproportionately to people living with chronic health conditions such as HIV. As a result, people enrolling in these plans are facing unaffordable copays for drugs. While Amida Care represents an example of what can happen with HIV care, it also struck me as very far off in the future for many states, especially those in the South where the problems of a lack of insurance coverage and of affordable health care are the most acute. Already, the ACA is being implemented unevenly throughout the country. If the Supreme Court decides in King v. Burwell that federal subsidies only apply to state run exchanges, this problem will be exacerbated. The panel, though, provided some useful strategies going forward to increase coverage for people living with HIV in states that are lagging behind. Regardless of the result of King, Ms. Harris from CMS had an exchange with Professor Greenwald (a member of the PACHA and co-chair of its Health Care Access Committee) that showed me how advocates and the government can work together to help resolve these issues. Professor Greenwald noted that the cost-control language in Medicaid regulations has proven very effective and urged HHS to work towards implementing similar regulations for marketplace plans along with stronger anti-discrimination provisions. The agreement among the panelists and others in the room that this was needed made me hopeful that, with increased government scrutiny on insurance companies, some of the practices CHLPI has been documenting might begin to be fixed. The panel provided the unique opportunity for me to see the work of the Speak Up project being used to advocate directly for policy changes (and I also enjoyed the momentary break from Boston’s constant snow). Though the panel definitely showed me that an uphill battle still exists to fix many of the issues regarding HIV care, the example of Amida Care highlighted that real change is attainable that will make a difference at both the individual and the public health level. to help analyze the role of mental health and reproductive rights in international law. In particular, the analysis will focus on national and international law related to countries in Central and South America. All applicants should therefore have sufficient Spanish fluency to be comfortable reading and analyzing legal documents written in Spanish. This position is paid and will likely last until the end of the spring semester. Work/study eligibility is not a requirement. Applicants should provide a brief statement of language skills, interest, and background, if any, in international law, human rights, or reproductive rights. If interested, please apply by email to Katie Garfield at kgarfield@law.harvard.edu. Emily Broad Leib, Director of the Food Law and Policy Clinic, joined other food advocates for the 1st Annual Food Tank Summit, hosted by Food Tank in partnership with George Washington University. The summit, spanning January 21 and 22, featured different speakers from the food and agriculture field, including researchers, farmers, chefs, policy makers, government officials, and students. Emily spoke on the “Pushing for Better Agriculture Research and Policy” panel on January 22 to share the Food Law and Policy Clinic’s ongoing advocacy for increased access to healthy foods. Emily Broad Leib, Director of the Food Law and Policy Clinic (FLPC), received one of seven grants awarded for research projects aimed at confronting the challenge of climate change and accelerating clean-energy solutions. The Climate Change Solutions Fund was created by Harvard University’s President Drew Faust to hasten the transition from carbon-based energy systems to those that rely on renewable energy sources and to propel innovations needed to accelerate progress toward cleaner energy and a greener world. Emily and the FLPC team will use their award to further their research project Reducing Food Waste as a Key to Addressing Climate Change and continue addressing the global problem of food waste. They are identifying key legal and policy levers to reduce the emissions associated with food waste by investigating, amending, and enacting new polices ― such as tax incentives and liability protection ― that remove the barriers to food donation. They will also continue to raise awareness of the billions of pounds of food wasted because of confusion from misleading food expiration-date labeling, an issue first brought to light in a 2013 report released by the Food Law and Policy Clinic and the Natural Resources Defense Council. Forty percent of food produced in the United States goes uneaten, according to Emily Broad Leib. “I’m thrilled that through this support we will have the opportunity to expand our work looking at creative ways that we can use law and policy changes to significantly reduce food waste and its harmful environmental impacts, while at the same time increasing food donations and improving food access,” Emily said. On January 30th, Robert Greenwald, clinical Professor of Law and Director of the Center for Health Law and Policy Innovation, was the keynote speaker at the 7th Annual Hunger Action Summit sponsored by the Second Harvest Food Bank of Santa Clara and San Mateo Counties and held at Santa Clara University. Robert’s presentation highlighted efforts to secure insurance coverage for medically prescribed food, focusing on opportunities for such coverage through the Affordable Care Act and other related health reforms. 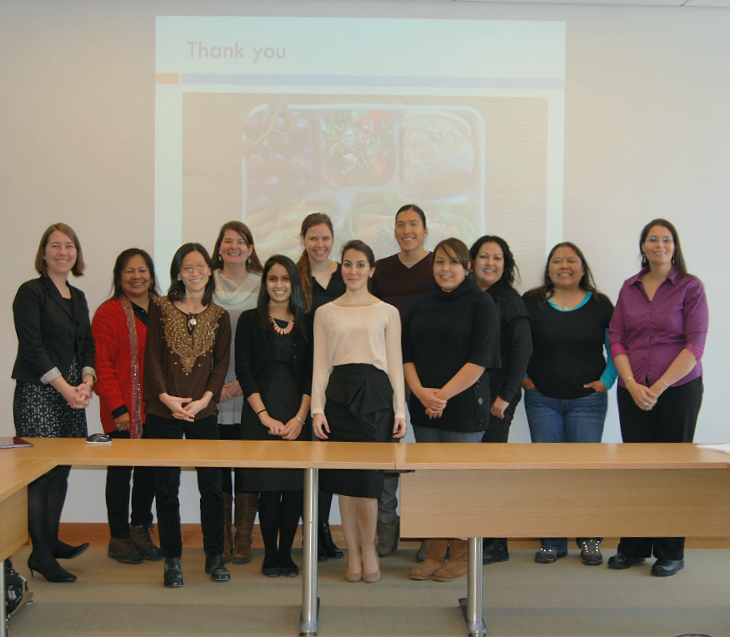 The presentation described replicable Food As Medicine models that have proven to improve the health of underserved populations, reduce health disparities, and promote more equitable and effective healthcare and food systems. Last week, the Jackson Free Press published a cover story, via the Hechinger Report, on Breastfeeding Rates in Mississippi. Despite the numerous health benefits, Mississippi has some of the lowest breastfeeding rates in the country. This is especially problematic because the benefits of breastfeeding address many of the health issues that plague Mississippi, such as high rates of diabetes, SIDS, and obesity. The Jackson Free Press also published an article focused on whether policy changes can increase breastfeeding in Mississippi. The articles feature the efforts of Desta Reff, the Harvard Delta Clinical Fellow, and her efforts to increase breastfeeding rates through programs and policies within the state. As the Harvard Delta Clinical Fellow, Desta is a joint appointee of Harvard Law School and Mississippi State University and works, in close collaboration with CHLPI’s Food Law and Policy Clinic, to improve public health and economic development in the Delta.